Well-ventilated, light aero lid with surprisingly great built-in visor. Aero road helmets are a trend we're seeing more and more of these days, as the focus for marginal gains moves from weight to aerodynamics. Casco were one of the first manufacturers to introduce such a helmet, their distinctive Speedtime helmet being a staple on the track. The Speedster helmet we've got here looks to take some of that knowhow and translate it to a more realistic price point (relatively, of course). 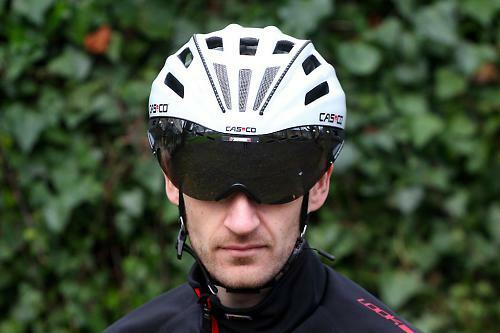 In common with some other aero helmets (Giro Air Attack for example), the Speedster is designed to be used with an integrated visor, which both improves airflow as well as providing for a better field of vision. The attachment to the helmet is via a simple clip on each side, and is really easy to use if you need to remove the visor for cleaning, for example. 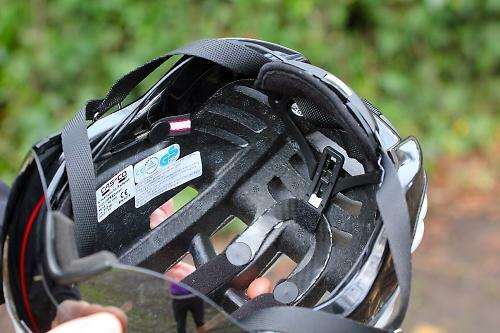 The visor is attached to the clips by elastic which means that it can also be lifted up onto the helmet, useful for when climbing at low speeds to stop sweat fouling the lens, or when putting the helmet on and taking it off. The lens itself is a high quality item which wraps around the whole of the frontal section of the helmet. The test model came fitted with the grey lens, the most reflective available, but clear and orange (low light) lenses are also available to purchase separately for £50. Additionally, the helmet is available with no visor at all for £100. When it comes to aero helmets, the difficulty is in balancing the competing interests of low drag and adequate ventilation. Compared to other similar helmets, the Speedster has quite a lot of vents, which makes it look almost like a 'normal' helmet (if you take the visor off). The result is that ventilation is good and shouldn't be an issue except in the hottest conditions. For the UK, I would be happy with wearing the Speedster all year round. The key to the Speedster's aerodynamic slipperiness apparently comes down to its ventless side panels and the 'adaptive' (though they looked pretty fixed to me) vents at the rear. The intention is to provide direct channels for the air to flow front to back through the helmet, while minimising the intake/expulsion of air from the sides which would increase drag. Whereas the difference in speed between a normal road helmet and a full-on TT helmet is noticeable – often a good couple of kph – the comparison of the Speedster to a standard helmet is much more subtle. Without the controlled setting of a wind tunnel or covered track, it's difficult to quantify the reduction in drag, though I think it's safe to say that the Speedster will be faster, even if by a small amount. The Speedster employs a fairly standard looking retention system that makes use of a dial to tighten or loosen the cradle. The dial is big enough to handle with gloves on, and has a nice, positive click action to let you know exactly what's happening back there. Casco have also seen fit to include quite a thick bit of padding back there, which certainly helps in the comfort stakes. The system has 3cm of vertical adjustability in 1cm increments, which is just about acceptable for a top end lid. Those who like to position the cradle low on the back of the head might find the Speedster a bit limiting in this regard. One of the unique features of the Speedster, and indeed, many of Casco's other helmets is that it uses a clippie thing (that's a technical term) instead of a more usual buckle. Instead of joining beneath the chin, the clip attaches to the metal loop which is used to connect the forward and rearward sections of strapping, placing it directly beneath your left ear. The result is that the section of strapping under the chin is free from any protrusions that could cause discomfort, and a further bit of foam padding has been added to reduce potential chafing even further. At first, this fixing system felt very fiddly and difficult to operate without resorting to using both hands, but eventually the technique required for single handed operation became more natural. It's probably a stretch to say that this system is any better than a bog-standard buckle, it's just different. One disappointing thing about the straps is that the positioning of the webbing around the ears is non-adjustable. In my case, the straps were perfect and lay flat against my head, but it would still be nice to have some adjustability here, for those with different head shapes and/or preferences. Out on the road, the first thing that strikes you is the feel of having an integrated visor, and in particular, the quality of the lens used. There is virtually no optical distortion which makes for a very clear and crisp view ahead. This is accentuated by the fact that there are no sunglass frames to get in the way, so peripheral vision, and vision up the road when in a more tucked position, is excellent. Despite using the darkest grey lens on some decidedly overcast days, I never felt like I was missing any road detail, such was the clarity of the optics. One potential source of concern, which was voiced by a number of riders, was the issue of having the lens fog up. In my time testing the Speedster, fogging was only an issue on one occasion, when climbing very slowly on a humid day, and even then it wasn't a problem at all. I suspect this is because the lens sits quite some way in front of the face, which allows plenty of space for air to circulate behind it. The distance between lens and cheek has another, possibly unintended, benefit too, which only became apparent after taking the Speedster for a slide along some asphalt at 50 kph. The helmet itself did its job, soaking up the impact (and cracking in the process) and preventing me from anything worse than a mild concussion, while the damage to the visor indicates that without it, I would've done quite a bit of damage to my face also. As it was, I walked away with only a few scratches on my lip and cheek. Undoubtedly, some people will find the idea of wearing an aero helmet with integrated visor out on a training ride ridiculous, and in the past, I'd be one of the first to agree with them. However, having experienced the quality of the optics and the unlimited peripheral vision it offers, in addition to the extra safety, I'd be quite happy to suffer the sniggers of my fellow cyclists and wear the Speedster all the time. If I hadn't destroyed it, that is. The integrated visor is the stand-out feature, but the Speedster also offers up a well-ventilated and reasonably light helmet, at a price point cheaper than most of the competition. 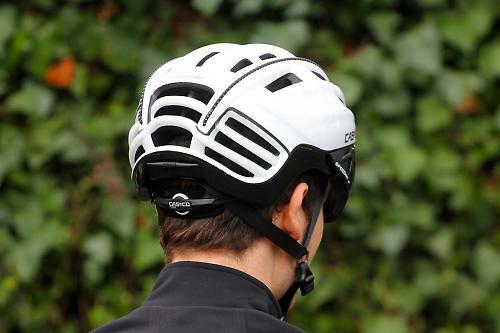 The Speedster is designed as an aero road helmet, therefore suited to faster races and perhaps the odd time trial. That said, it performs well in the day to day too, making if perfectly acceptable as a training lid. Generally very good, though the reflective piping could have been neater. Though the aerodynamic benefits are marginal over a standard helmet, comfort, weight and ventilation are all pretty good which means that there's no real compromise to be made. The visor optics were excellent and offered great peripheral vision. Didn't really have the helmet long enough to test this as I crashed and wrote it off quite early in the test period. At 310g it's not super heavy, especially considering the integrated visor. Generally good, but it could've used a bit more vertical adjustability in the retention system. One of the cheapest aero road helmets around, and considering the visor is included, looks to be quite good value. Very well - the Speedster felt no different from a standard helmet when just riding around, whilst still offering some aero benefits. The optics of the integrated visor are excellent. Limited vertical adjustability of retention system. For 5 years, racing was my life and I went all the way from a newbie bonking after 40 miles, to a full-timer plying my trade on the Belgian kermesse scene. Unfortunately, the pro dream wasn't meant to be and these days, you're more likely to find me bimbling about country lanes and sleeping in a bush on the side of the road. For that money I would have liked a visor that retracts easily for climbing, like the ones you can get in some construction helmets, I always remove glasses when climbing, but have them on at all other times, so I would be interested in such a helmet, and also with both light and dark tint options. erm... can you wear that visor over prescription glasses? What's with the "erm"? What does it mean or try to convey please? … and soon to be seen on a commute near you, no doubt. I need my prescription eyeglasses too see clearly, so I'm also curious as to whether there is room enough for such under the visor. I've tried contacts, but never gotten used to them. So, come summer I sport some Polaroid sunglasses that go over the prescription ones. Those Polaroids are quite big, dark and apparently designed with this kind of usage in mind. The complete assembly still has shades of Eddie Edwards and the Winter Games of 1988 to it. you mean like this Abus helmet? ...Well yes Al, exactly like that! I'm due a new lid this year, I will try and find one in real shop for a wee play. Call me a skinflint, but I struggle to see what makes a 130 hat different from a 30 quid one, but this one really appeals, assuming it doesn't fog up like the Kask bambino I borrowed for a TT recently, though its easy just to slide it out the way if it does. Dead or alive, you're coming with me. Does this come with a jersey which says 'you have 20 seconds to comply' printed on the front? Dont think even Judge Dredd would be seen in so bug eyed a monstrosity?! Good to know that it accommodates glasses, thanks. Apparently so does the Abus helmet as well. Yep, I can confirm this. Managed to fit the visor over my normal sunglasses which are pretty large. It's tight, but it'll work. Should've used the orange visor - I really wanted to say "red 5 standing by"
"only became apparent after taking the Speedster for a slide along some asphalt at 50 kph"
It seems road.cc are requiring reviewers to go to previously unheard of lengths! Glad you're OK(ish) Liam! Do you have anything in stock that will make me look like a bit of a bellend? My budgets up to about 150? Honestly - unless you can time trial like Das Panzerwagen then you'll look like a right tryhard muppet in this. But if you pull along side me wearing this I'm going to laugh like a hyena on acid. Not only for what you look like but for how much you paid.